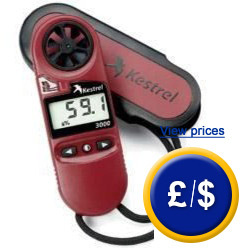 The anemometer AVM-3000 is easy to use and it measures wind speed and temperature. This anemometer is equipped with a light propeller. Therefore it is possible to measure exact wind speed and air flow even at low speed. The vane with a diameter of 0.25 mm is made of anodised aluminium. The anemometer shows values of instantaneous speed, maximum speed and average speed in desired units. Usually, these functions are just included in considerably more expensive instruments. The large figures are highly legible. In addition, the anemometer shows temperature in °C and calculates cold wind temperature with an accuracy of ± 1 °C (wind chill). Power supply is provided by standard lithium batteries which are easy to change. If the anemometer is used properly, shelf life will be about 400 operating hours. Furthermore the anemometer is equipped with an automatic switch-off function (the anemometer will be switched off after 30 minutes of being inactive). The casing is made of non-destructible plastic. If you have any questions about the Anemometer AVM-3000, read the following technical data or contact us: UK customers +44(0) 23 809 870 30 / US customers +1-410-387-7703. Our technicians and engineers will be happy to help you with all anemometers and all products in the field of regulation and control, measuring instruments and scales. The wind chill, which is measured by a lot of our anemometers, describes the difference between the measured and felt air temperature, depending on wind speed. The wind chill is a benchmark for the wind-related air cooling of an object, especially of a human being. The wind chill effect is caused by convective evacuation of very close and relatively warm air as well as the increasing rate of evaporation. The required energy to get a phase transition of the water will be deducted by heat conduction of the objects surface and will cool it. Therefore the wind has got the characteristic to push the adoption of the object surface temperature to the ambient temperature. Human beings see this as a cooling effect. This effect is valid for objects that are exposed to the wind. However, there are other conditions for human beings. Because of the preparation efforts, there are no other formulas to calculate this effect. Wind chill therefore always depends on human beings. If the temperature is high, there won't be a wind chill effect. Wind chill will be calculated in a region near 0 °C.